After a ten year drought from visiting the Diocesan Finals, this year’s Ss Peter & Paul’s Varsity Softball team was proud to represent against St. Gregory the Great. Unfortunately the competition was too tough to handle, even with the Knights completing an amazing three double plays in back to back innings. The hard fought battle ended in a 9-3 loss, but a fun season overall. Congratulations girls on a great year: Eighth Graders Lorena F, Jaiden M, Sophia Y & Olivia Z, Seventh Graders Abby B, Ashley D, Elizabeth F & Kennedy K. St Mary’s of Swormsville sisters Rosie & Maddie D and Carly A for playing up from JV. Thank you all for trying hard, learning every day and coming together as a team! So proud of all you all for your personal and group accomplishments this year! Go Knights! Our Varsity Softball team clinched their playoff spot with an amazing come from behind win over rival St. Greg’s 8th grade team last week. The Cougars took an early lead scoring four runs in the first while stopping the first three Knights for outs. Hits by Jaiden M and Maddie D scored a few runs in the next three innings to cut the deficit. Defensive plays by Abby B, Rosie D, Elizabeth F, Sophia Y and Olivia Z held St. Greg’s to just one run in each of the next four innings, and none in the seventh. Ss Peter & Paul’s bats came alive in their final at bat with hits by Rosie, Sophia and Jaiden to score five and win 10-8. Congratulations girls, finishing first place in the league and playing in the North Division Championship Game Tuesday, June 5th at 4:15pm. Good luck lady Knights! The rain held off for the Varsity Knights to play St. Mark’s in their opening game. Ss Peter & Paul took advantage of the Lion’s first game jitters and quickly scored two runs on a Sophia Y bunt and a Rosie D hit. Play was quick and evenly matched for the next few innings thanks to put outs by infielders Lorena F, Olivia Z and Ashley D. And then the fun began when the Knight’s lit up their bats, scoring 10 runs in the final three innings with hits by Abby B, Kennedy K and Olivia Z. Maddie D slugged a double while her sister Rosie also had a double and a bases loaded clearing triple. Elizabeth F put the icing on the cake when she crushed a triple and home run to seal the win against St. Marks 13-1. Congratulations girls! On another beautiful day for softball, Ss Peter & Paul roughed up rival St. Greg’s 7th grade team with their aggressive hitting. Base hits by Abby B, Maddie D, Ashley D, Jaiden M, Sophia Y and Olivia Z showed the depth of the Knight’s lineup. But the Cougars were caught on their heals when power hitters Elizabeth F launched her triple and Rosie D found her bat’s sweet spot for a double and two triples! The Knights defense held St. Greg’s to just three runs, closing out the game with a double play line drive/ put out by Elizabeth to seal the win 11-3. Congratulations girls! Ss Peter & Paul Varsity Softball team celebrated their opening day double header with blue skies and a sunny 70 degrees facing Nichol’s and St. Greg’s 8th Grade. Feeling a little nervous, the Knights’ offensive started slow, but their defense was on, holding Nichol’s to just two runs. 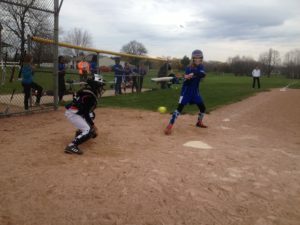 Jaiden M made her softball debut with a solid performance at first base. Rosie D (playing from St. Mary’s of Swormsville) and Sophia Y combined for 12 strikeouts to keep Nichol’s bats quiet. SSPP started hitting just in time with a triple from Olivia Z in the 6th inning to clear the loaded bases. She then scored on a hit by Ashley D to solidify the Knight’s win 4-2. All warmed up, Ss Peter & Paul came out swinging against St. Greg’s, taking an early 11-7 lead with hits by Kennedy K, Jaiden, and Elizabeth F. Once the Knights were on base, everyone advanced with a stolen base to get into scoring position. Strong defensive performances by Jaiden, Elizabeth, Rosie and Sophia helped keep St. Greg’s at bay for a while. But the Cougars roared back in the late innings with a handful of hits to tie the game. Jaiden scored the winning run on a hit by Kennedy to lock in the win 18-17. 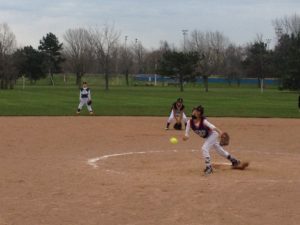 Our Lady Knights, behind the outstanding pitching of Gianna Z, some timely hitting by our team and great play in the field, went 9 innings yesterday and defeated St. Greg’s 4-2 in the most exciting game of the year – so far!. The entire team contributed by making incredible plays in the field. Emily P, Margaret W, Marisol B and Sarah F were solid all game in the infield. Hanna G and Riley O anchored the outfield and Riley D was solid behind the plate helping the team to continue our march through the playoffs. Good luck ladies and keep up the outstanding play!! What an exciting game yesterday as our Lady Knights had their first softball playoff game and pulled off a come from behind victory with an extra inning win over St. Stephens 8 to 7!! Gianna Z led the way both defensively with her pitching and offensively with her bat. With the team down by 2 runs in the bottom of the 8th inning and bases loaded with 2 outs, she hit a 3 run triple to win the game. Good Luck ladies GOOO KNIGHTS !!!! With the sun shining and the grass freshly cut, the JV Softball team wrapped up their season against rival St. Greg’s. The Knight’s defense started strong, with plays made by Hannah Z and Cassidy M, with support from Savannah E, Juliet T, Abby B and Oaklie Z. SSPP had trouble with the strong Cougars pitching early on with only Sophia Y and Genevieve B hitting singles. Lorena F scored on a sacrifice hit from Cassidy. Genevieve, Kennedy K and Amelia M shared pitching duties. A last inning rally scored Elizabeth F off a home run by Sophia, but was not enough to beat St. Greg’s this time. 4 wins, 3 losses, infinite memories! Ss Peter & Paul JV Softball team could only muster eight players in back to back appearances last night to face St. Peter’s at their home field in Lewiston. The Knight’s scored six runs in the first inning on doubles by Sophia Y and Olivia Z and a single by Genevieve B. Strong pitching by Sophia and Genevieve and a clean put out at first by Savannah E held St. Peter’s Cougars to just one run after three. Ss Peter and Paul continued to swing away with Savannah having her first hit of the season. Teammates Amelia M, Oaklie Z, Abby B also had hits and scored. The Knight’s defense held strong and finished with a win 17-2. As game time approached, the Ss Peter & Paul lineup continued to shrink to eight while the field of green Nardin players grew in height and quantity. 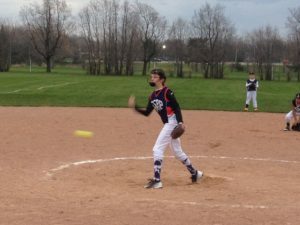 Behind Genevieve B on the mound with five strikeouts, the Knights worked hard to keep the game close, but Nardin had other plans. After loading the bases in the third, they powered a home run to center, extending their lead to 8-0. The Knights posting their first two runs in the third off doubles by Sophia Y and Olivia Z. 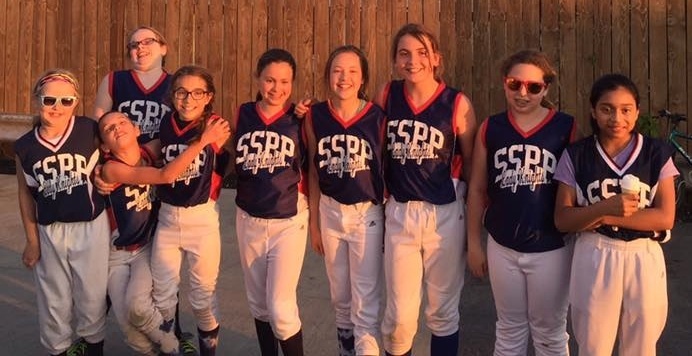 They added five more runs in the fourth helped by a hit from Abby B and aggressive base running by Juliet T and Cassidy M. Hannah Z, Oaklie Z and Olivia Z shared catching duties for SSPP. Sophia joined the pitching team, striking out five of the next seven batters faced, holding Nardin’s lead to one going into the last inning. Nardin only added one more run with Juliet making a great out at first from right field. The Knights kicked off their rally with a triple off both Sophia and Olivia’s bats. Abby added a double scoring two runs and tying the game. With the winning run in scoring position, Genevieve hit a double to finish the Knights come from behind victory 11-9. 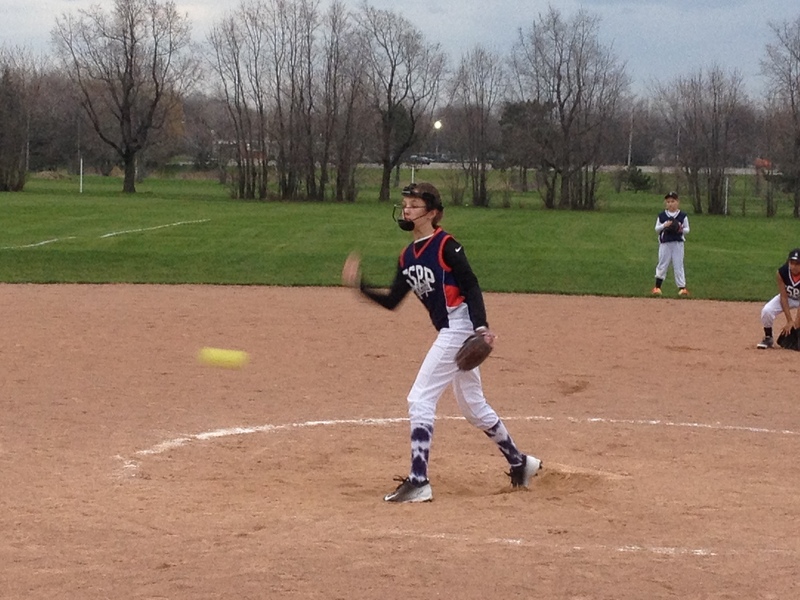 The clash of the Lady Knights played out on the diamond last night with Ss Peter and Paul hosting St. Amelia’s. Testing their defense, SSPP led off with Genevieve B bunting and making it to third on two over throws. Sophia Y followed with a squeeze bunt to bring her teammate home. She quickly made it around the bases and scored on a hit by Amelia M. Juliet T and Lorena F each had a hit and stolen base the following inning, but were left on. 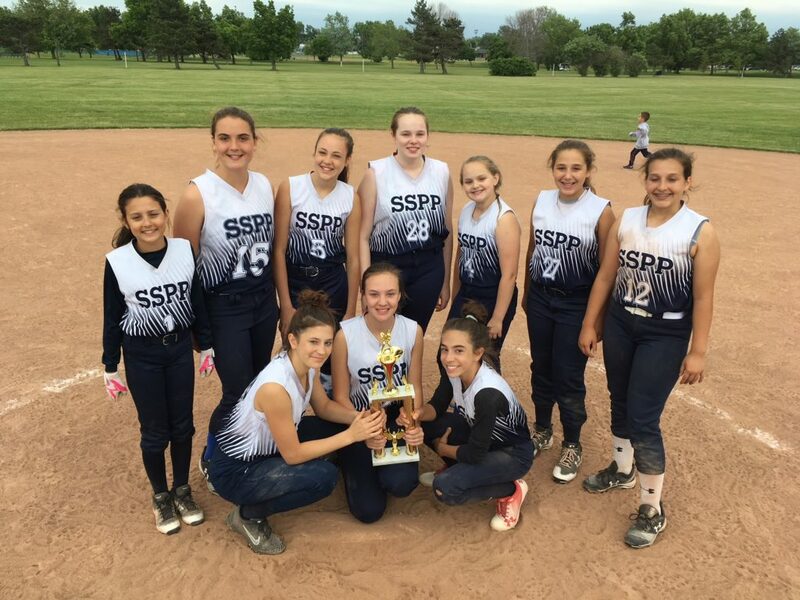 SSPP held St. Amelia’s to no runs until the fourth inning behind solid pitching from Genevieve and Olivia Z and great catching by Elizabeth F and Amelia. The Knight’s strong defense was highlighted by a rare triple play – a pop fly catch by Sophia at first, put out of the runner on first and a throw to Genevieve at third for the final out. Rolling that excitement into their at bats, Sophia crushed a triple and was hit home by Hannah Z. Olivia and Oaklie Z each had a hit and stolen base the following inning, but were left on. Savannah E, Kennedy K, Abby B and Cassidy M all got their bat on the ball but were put out at first. Going into the bottom of the last inning with the score tied, a reenactment of the first inning with Genevieve and Sophia Y was executed: bunt, steal, steal, squeeze bunt, score – Ss Peter and Paul wins an exciting victory 5-4. Awesome game girls! Taking what they learned at their schooling from St. Greg’s earlier in the week, the JV softball team took the field with fire in theirbellies ready to play against Christian Central Academy. The Knights’ strong pitching line up of Sophia Y, Genevieve B and Olivia Z put three strikeouts on the board in each inning., holding CCA to just one hit and one run. Offensively, SSPP’s bats were on fire with multiple hits from Hannah Z and Olivia Z driving home Oaklie Z, Abby B and Savannah E. Lorena F and Kennedy K each added a hit, scoring Elizabeth F and Amelia M. Speedy Juliet T stole two bases and scored twice to seal the Knights win over CCA 19-1. Super game girls!